FOXBOROUGH, Mass. — The Super Bowl MVPs were leaving the team cafeteria when Bill Belichick stopped them for an impromptu coaching moment that neither could have anticipated. 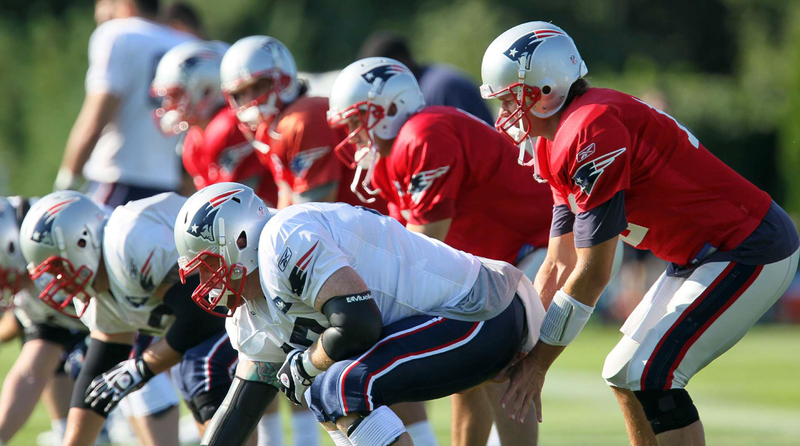 This was during training camp in August 2005, six months after New England had won its third championship in four years. Deion Branch, the MVP in Super Bowl 39, and Tom Brady, twice a Super Bowl MVP before him, had been connecting like never before. “For three days of practice, I think we got up to like 50-some completions,” Branch recalls. Belichick took notice … and he didn’t like it. The coaching staff had been counting Brady’s pass distribution, and the numbers were skewed toward Branch while Troy Brown, David Givens, and the others were seeing the ball less and less. Brady tried explaining that they were simply running their plays and trying to make their rapport even better. He’d hit Branch on the same route four or five times in one session, wanting it to be perfect. Brady was taken aback at first, but he let the lesson sink in. “Tom didn’t throw the ball to me the next two days,” Branch says. “He understood what coach was trying to do.” That season, Branch remained Brady’s favorite target. But while he caught 78 of Brady’s 530 passes, Givens also caught 59, Brown caught 37, and 13 others had at least one catch from him. On Sunday, Brady and Belichick will play in their sixth consecutive AFC Championship Game, an NFL record. “Those two guys together,” former Patriots receiver Donte’ Stallworth says, “it’s like they found the potion for everlasting life.” If not that, they have at least found the most important ingredient for long-term success in the NFL: The Patriots’ best player likes to be coached the hardest. Imagine being a new player in the Patriots’ organization and going to your first meeting. Much to your surprise, the head coach has scoured the film and found the worst pass that his four-time Super Bowl champion threw last season—and he’s showing it to the team, letting it be known to all that he needs better play from the quarterback position. The coach suggests he could find a replacement down the road at Foxborough High, but Brady doesn’t blink. If you think that’s the norm in the NFL, it’s not, except for within the walls of Gillette Stadium. Tight end Martellus Bennett, a veteran of three other NFL clubs, chuckles and shakes his head side to side when asked if he’s ever seen a dynamic like this one. “Nooo,” adds former Patriots defensive coordinator Eric Mangini, who has coached in five NFL organizations, including two as the head coach. “There is almost this stigma to being coached.” The head coach of another AFC club tried a similar tactic with his team this season, showing the entire team clips of mistakes by a handful of his best players. One recently paid veteran responded by standing up in front of the room and screaming at the coach. In Foxborough, the measure of a great quarterback is not Brady’s 12 Pro Bowls, four Super Bowl rings, two league MVP awards or owning, at age 39 this season, the best TD: INT ratio in NFL history (28:2). Rather, it is a catalog of moments when the best player on his team—perhaps the best player ever at his position—approaches his job as if he’s the worst. 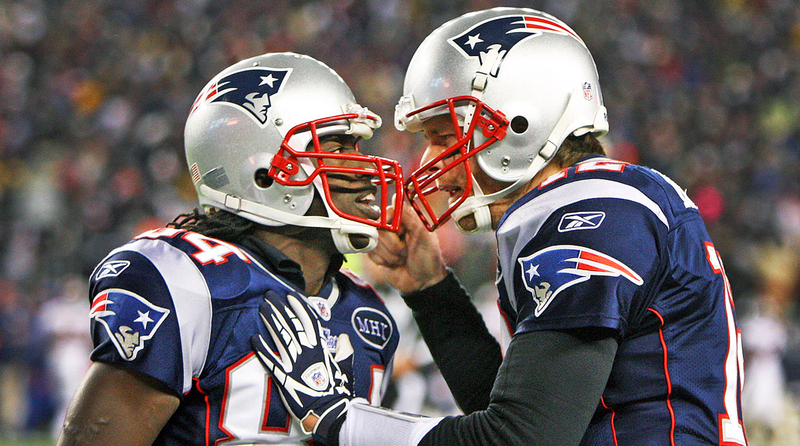 Tom Brady (r.) and Deion Branch. ROSS TUCKER, Patriots offensive lineman, 2005-06: “We are having a lot of issues with the snaps from center. Guys are dropping snaps. The quarterback-center exchange is not going well. Belichick comes up to all of us, Brady included, before a practice and says, ‘Hey guys, I played center, and I sucked. But I could at least snap the ball to the quarterback, and we could at least have a smooth exchange. 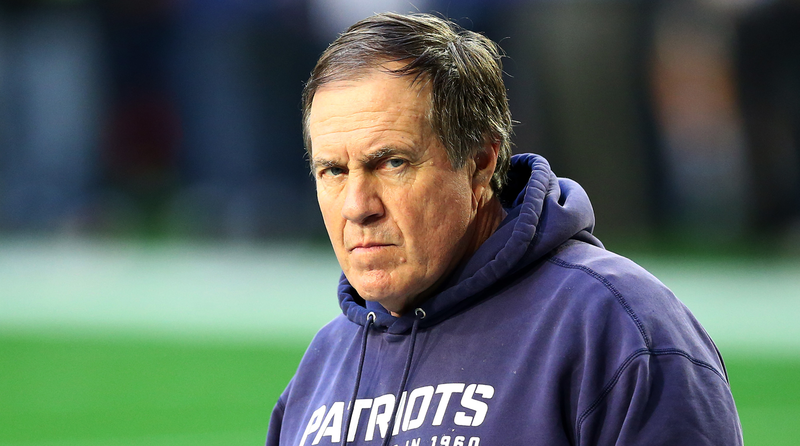 So from now on, every time the exchange is bad, we are running.’ Bill Belichick doesn’t yell at you. He just says it like a jerk. There’s no other way to describe it. 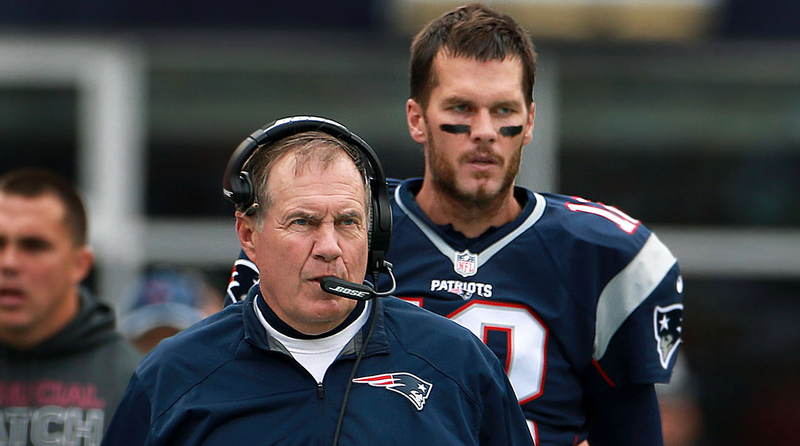 “Brady took it, I felt like, as if Belichick was just talking to him. At the time, there were four centers. Dan Koppen was hurt, so it was Russ Hochstein, Gene Mruczkiwski, myself and Dan Stevenson. I will never forget: every time I was at center, Brady would look at me in the huddle and he’d say, ‘All right, Ross. You and me first. It starts with a great snap.’ Even though they asked Brady to do literally everything in an offense, in terms of re-declaring protections, re-declaring the Mike [linebacker], all that stuff. This was before he would call the play. I would look at him, and I didn’t say this, but in my head, I was like, ‘OK Tom! This is going to be a great snap!’ Like a little boy. At this point, I am 26 years old; this was my sixth year in the NFL; I had started 24 games, all that stuff. Tom Brady practicing snaps with center Dan Koppen. 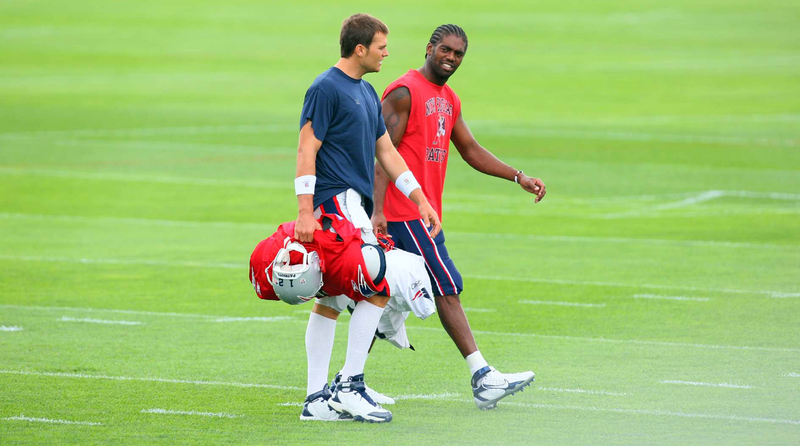 Tom Brady and Randy Moss during training camp. RANDY MOSS, Patriots receiver, 2007-10: “We were doing two-minute and I was the single receiver. Tom Brady gave me the signal to run a 5-yard quick out. Make a long story short, me and Tom didn’t connect. For whatever reason, the ball was not caught. The ball was thrown, but it was not caught. Was it his fault or my fault? I don’t care; the ball was not completed. So we come in the next day, Bill Belichick puts up the film and basically says, ‘Are you kidding me? I have my such and such All-Pro wide receiver, and I have my All-Pro quarterback, and y’all cannot complete a 5-yard out?’ He said, ‘Tom, I can go down here and get the local high school quarterback to come and complete me a 5-yard out.’ And everybody was like, Oooh. So basically, when he humiliated Tom, in front of the boys, man, we went out there and put everybody up. I don’t care who it was; whoever was on that defense that day, they got it. And that was practice. Tom Brady is intercepted in the end zone in the fourth quarter. On the sideline, he tells intended receiver Tiquan Underwood he should have made a better effort to catch the ball. A shouting match then explodes between Brady and offensive coordinator Bill O’Brien. Scot Loeffler has known Brady for two decades, ever since Brady was a lightly regarded freshman quarterback at Michigan who was willing to be used as a something of a tackling dummy for spring practice—because he would do anything for live reps.
Loeffler now coaches not far from where Brady plays, as the offensive coordinator at Boston College. Before hitting the recruiting trail after the Eagles’ December bowl game, he sat down to immerse himself in film of Brady’s 12 starts this season. At age 39, he seemed as mobile in the pocket as Loeffler could ever remember. Listen, this is the best I’ve ever seen you play, Loeffler wrote in a text message to Brady. 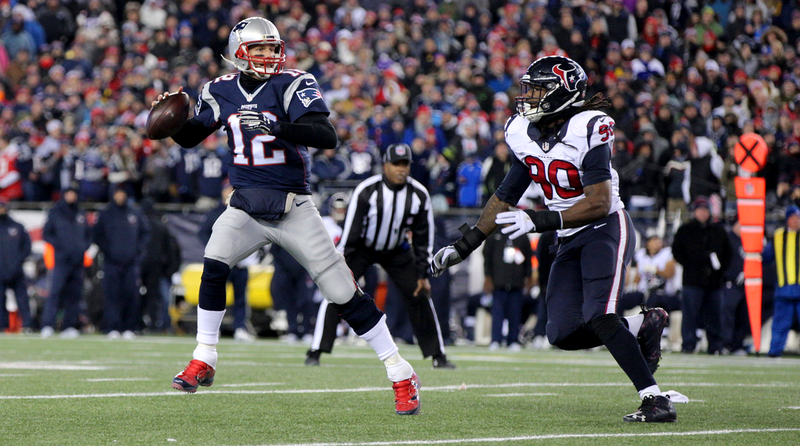 Tom Brady looks to throw with Jadeveon Clowney bearing down on him in last Sunday’s AFC divisional game. For the better part of the 1980s, Belichick was an assistant on the Giants coaching staff and saw Bill Parcells legendarily challenge Phil Simms on a daily basis. Walking out of the CBS broadcast booth at Gillette Stadium last Sunday, Simms grinned when asked if his relationship with Parcells was like the one Belichick now has with Brady. Ever the perfectionist, ever the coachable star, Brady was later asked about his relationship with Belichick as he sat in front of his locker. Nor will Brady, who is always competing for his job with Johnny Foxborough.